We are increasingly expectant that major tax legislation will become law as Republican leaders have indicated that after the latest round of quick negotiations, they have arrived at an agreement – the Tax Cuts and Jobs Act. We have been following the plans closely for the past year, particularly over the past three months, and continue to believe that the final version contains a host of changes that have both positive and negative impacts to middle and high-income taxpayers. We also believe that the legislation carries significantly more complexity than current rules, and look forward to discussing your situation in greater detail in the coming weeks. In the meantime, please see below a short list of actionable items before year-end as well as a handful of key provisions that may impact you as we head into 2018. Deferring Income and Accelerating Deductions: In anticipation of lower tax brackets in 2018 and more favorable corporate tax rates for many of our business-owner clients, the common strategy of deferring income into 2018 and accelerating deductions before year-end still applies (if you are in the green income brackets in the chart below). Consideration should always be given to managing tax liabilities over multiple years to avoid spikes in income and deductions that could cause you to pay tax at significantly higher rates. State and Local Taxes: The Act will prevent many of our clients from deducting their state income taxes paid beginning in 2018 as it imposes a $10,000 cap on the combined total of property and state income taxes. As such, risking the permanent loss of this deduction going forward, we recommend all clients consider paying their entire 2017 state tax liability before December 31st, as well as real estate and personal property taxes due in early 2018. Charitable Donations: The deduction for charitable donations will remain under the Act, however the standard deduction is scheduled to increase beginning in 2018 – from $12,700 for a married couple filing a joint return to $24,000. It is anticipated that this increased standard deduction, combined with the disallowance of deducting more than $10,000 of state and local taxes, will dramatically decrease the number of taxpayers who itemize their deductions. If you do not expect to clear the new standard deduction going forward, consider grouping two or more years of charitable contributions into a single year, then minimizing the deduction in the future. We believe that this only makes sense with existing charitable commitments, or through a Donor Advised Fund, as to not change your overall philanthropic plan. 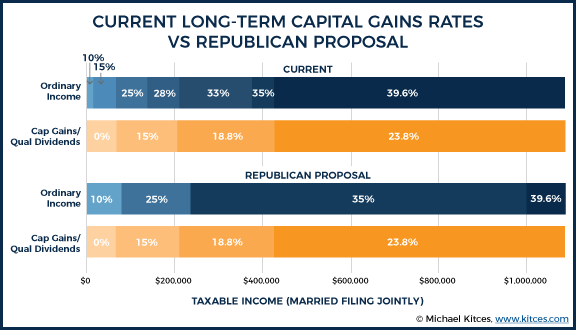 New Brackets: The top tax bracket will be reduced to 37%, down from 39.6%, and will begin at taxable income of $600,000 for a married couple filing a joint return. See comparison at right of current and proposed rates, which are generally favorable to everyone. Expanded Standard Deduction and Repeal of Personal Exemptions: The Act consolidates and expands the Standard Deduction and Personal Exemptions into a single, larger standard deduction of $24,000 for married couples (an increase from $12,700). With the repeal of Personal Exemptions, the larger standard deduction is only slightly better than the current benefit of both Personal Exemptions and the Standard Deduction, and less favorable for some. Business Income Tax: The most controversial of the provisions relates to the lower tax rate for some pass-through business entities, particularly when compared to the new, top corporate tax rate. The Act calls for a reduction in the top corporate tax rate, C-corporations, from 35% to 21% and elimination of the corporate AMT. Many pass-through businesses will receive a 20% deduction against their business income, or, in practice, their owners will be taxed on only 80% of business income. There are a number of restrictions in place intended to limit income eligible for the lower pass-through rate and “service” businesses are excluded if owner income is greater than $315,000. For many of our clients, we see this as one of the greatest planning opportunities in the Act. Once the Act becomes law, we plan to send a more comprehensive update outlining more provisions and planning ideas – stay tuned! November 3, 2017: Yesterday House Republicans released details of the “Tax Cuts and Jobs Act” (link: Tax Bill). 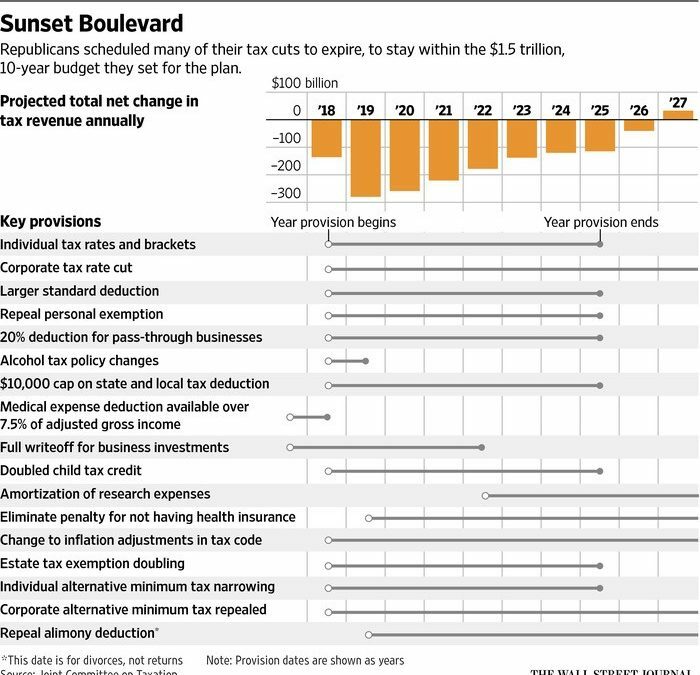 The plan calls for steep tax cuts in business tax rates, an eventual repeal of the estate tax, a reduction in the number of individual income tax brackets, elimination of the Alternative Minimum Tax, significant changes to itemized deductions and the standard deduction, as well as a host of other changes that have both positive and negative impacts to middle and high-income taxpayers. It is a tax cut, not tax reform. It is not the biggest income tax cut in history – not even close. For households, it will almost surely create winners and losers. Many middle-income households are likely to pay more under this plan, not less. At the end of 10 years, it likely would end up increasing the deficit by far more than the advertised $1.5 trillion (TPC estimates $2.4 trillion and it will not lead to a 3 percent permanent economic growth). Despite the lingering uncertainty and questions related to global policy: Legislative, Monetary (the Fed) and Foreign, the market has continued to grind higher, further strengthening the argument that despite the negative and uneasy sentiment, markets and global economies are actually quite healthy. 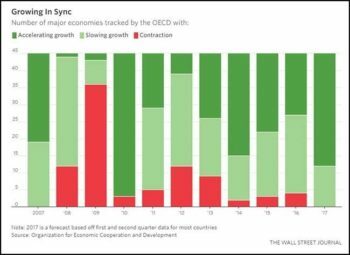 For the first time in a while we are seeing global economies growing in sync (See Chart) and this backdrop has provided healthy returns for just about every stock market around the world in 2017. October 16, 2017: The US Government announced on Friday that Social Security checks are going up 2 percent in 2018, which is the first substantial raise in years. 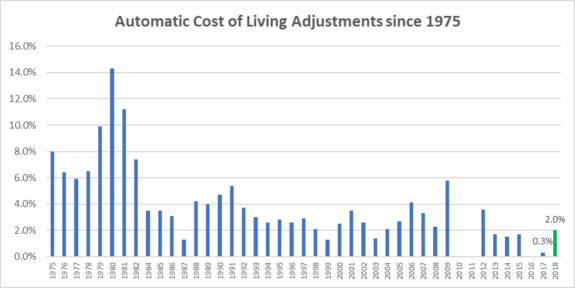 The raise is a cost of living adjustment (COLA) that’s meant to keep up with higher costs of everything from housing to medications. In 2017, the COLA was 0.3% and in 2016 it was 0%. Ironically, a 2 percent increase for 2018 coincides with the unwinding of the Medicare Part B “Hold Harmless” rule that has prevented increases in premiums for the past two years (because of the low, or non-existent, COLA). So, many retirees will have their Social Security increase almost fully offset by higher Medicare costs. Your Social Security retirement benefit is calculated by looking at your highest earning 35 years. You become eligible for retirement benefits after 40 quarters of earnings. For every year you delay claiming benefits past your full retirement age, the benefit increases roughly 8 percent per year. You can claim benefits before your full retirement age (age 66 for individuals born between 1943 and 1954), however if you earn more than $17,040 from employment in 2018 your benefit will be reduced. Married couples still have options for boosting their lifetime benefits and should have a coordinated plan for drawing Social Security. The first half of the year delivered superior returns for the US Stock Market as measured by the S&P 500 (+9.3%), but as we entered into the doldrums of Summer, that torrid pace slowed down considerably. June was a relatively flat month and the first few weeks of July have looked similar. 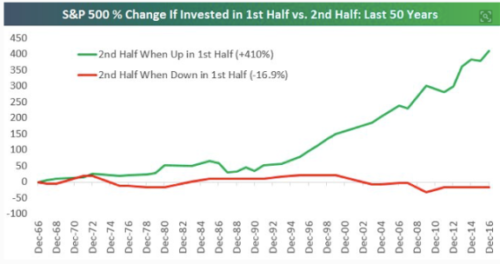 While a strong first half typically follows with a strong second half (See Chart), a summer pullback or continued consolidation would be healthy. That said, as we look to the chart once again, the trend is our friend and as we’ve learned throughout the years, you don’t fight it.